Eight biblical stories based on the parables of Jesus. Just as Jesus used stories to teach those around him, we can use the same stories to share the message with our own children. Firstly the scripture and reference are given. I like to read that first so my kids hear what the parable was in the scripture. Then the illustrated parable is written in a 1st or 2nd grade reading level. It is easy for toddlers to understand, and it allows big brother or sister to read to them! Nothing blesses my heart more than to hear my 10 or 8 year old read Bible stories to my 5 year old! The illustrations are delightful and add humor to the parables. Laughing and dancing sheep, the merchant man with a large pink feather in hist hat, and squeezing the camel through the gate were all fun additions to the story. 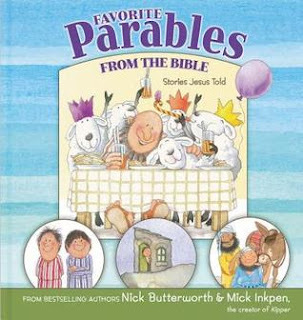 The parables in this book are brought to life through simplicity and great illustrations! 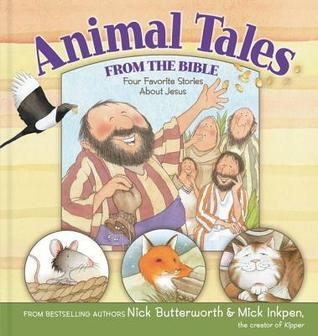 Four stories narriated by a fox, cat, magpie and mouse; all who encountered Jesus first hand. This collection was first published in 2002 and is being released again for a new generation of little people age 4-7. Darling illustrations from the creator of Kipper. The illustrations engage the child as you read about the adventures of these animals. The fox tells his first hand account of the birth of Jesus. The cat shares a tale of Jesus turning the water to wine at a wedding. A Magpie encounters Zacchaeus when he climbs into his tree to see Jesus passing by. A ship's mouse witnessed Jesus calming the storm. Tales told from an animal's voice always resonate with my young children. I can just imagine their little brains churning with the pictures of the animals in the story, visiting with Jesus. Sharing scripture in a new voice, gives the children a newness of the classic story. Telling it from a different angle, with darling illustrations may give longevity to the truths for the youngest ones. I received a copy of these in exchange for an honest review. I love these cartoons that tell the stories of Jesus. I remember watching them when I was small and I learned so much about the bible in those formative years from them! Thanks for one's marvelous posting! I really enjoyed reading it, you will be a great author.I will be sure to bookmark your blog and will eventually come back in the foreseeable future. I want to encourage you continue your great posts, have a nice holiday weekend!